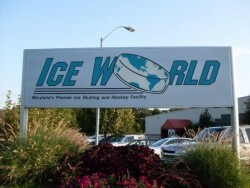 IceWorld opened in 1996 as a twin rink facility conveniently located in suburban Harford County, Maryland. We are open year round and we are fully handicapped accessible. Under one roof, we have two NHL size (200' x 85') rinks, eight team locker rooms, seating for up to 300 patrons, a full service Snack Bar and a state of the art Pro Shop. We are located just off of I-95 about 10 minutes north east of Baltimore, Maryland.